Drama on the high seas based on a true tale of modern-day piracy, Captain Phillips offers unyielding tension and a noble Tom Hanks performance. It's 2009, and American Captain Richard Phillips (Hanks) leaves his New England home and wife Andrea (Catherine Keener) and journeys to the Middle East to takes command of the Maresk Alabama, a container ship traveling from Oman to Mombassa. Wary of pirate activity off the coast of Somalia, Phillips attempts to increase on-board security and readies his crew for a possible attack. But he is already too late. A band of desperate Somali pirates give chase in two speedboats. The fearless Abduwali Muse (Barkhad Abdi) is a wiry pirate, urging his men to maintain the chase, but Phillips is able to fend off the first attack by pushing his ship to full speed and creating a large wake. Undeterred, Abduwali returns within hours, with a faster boat. This time, and despite the best efforts of Phillips and his crew, Abduwali and three cohorts all wielding assault rifles make it on board, take control of the Alabama and demand a ransom. In the face of the agitated pirates, Phillips has to try to keep his men and his cargo safe while awaiting rescue. When the crew unexpectedly overpower the isolated Abduwali, Phillips has a chance to free the ship but at the cost of his own liberty. While there is debate about Phillips' version of actual events as recounted in his book A Captain's Duty: Somali Pirates, Navy SEALs, and Dangerous Days at Sea (2010), the film adaptation is a well-executed story of survival and perseverance, with both Phillips and Abduwali pushing events to the limit. Phillips never stops trying to undermine the pirates, and Abduwali never loses sight of his ultimate objective: a large ransom in exchange for either an American ship or an American man. Once the premise is set and the pirate attack starts, director Paul Greengrass grasps a large wrench, latches on to the tension dial and does not stop twisting. For the final 90 minutes Greengrass provides no respite, as Phillips lurches from one crisis to the next, the hand-held, jerky camera work amplifying the fears of a man thrust into an out of control situation with no definable end. As the drama moves from the large container ship to the claustrophobic enclosed lifeboat, with navy destroyers armed to the teeth menacingly closing in, global imperatives of no negotiations, no success for the pirates, and no chance of Phillips being allowed to reach the Somali shore as a hostage, crush what started out as a local act of piracy. Both Phillips and Abduwali become subject to much greater global forces, their fate tossed around just as their lifeboat bobbles in the ocean. Tom Hanks is comfortably within his element as Phillips, a common man catapulted into uncommon circumstances and having to think his way out of a dangerous situation. 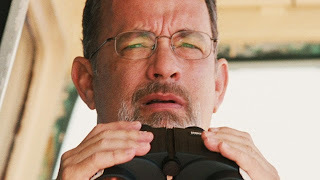 Hanks does convey some unresolved tension between Phillips and his crew, the relationship never pretending to be anything more that professional. 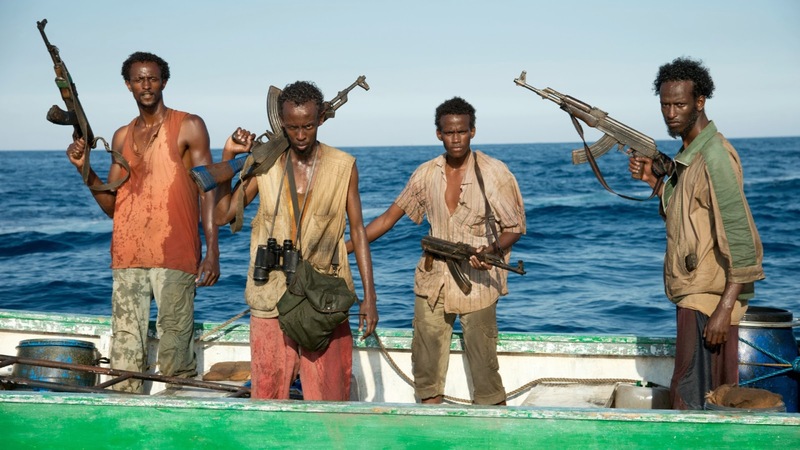 Barkhad Abdi's performance is more edgy, Abdi finding the seam where a fisherman becomes a pirate and does the dirty work demanded by warlords. If Hanks provides the soul of the movie, then Abdi provides most of the electricity, capturing a man having to constantly back away from the brink in order to save his life, feed his family, not lose the respect of his men and hang on to a chance of a payday. Both Greengrass and Hanks save the best to the end. Greengrass delivers a climax dominated by extreme yet controlled tension, the Navy SEALs moving in to try and do their thing under unforgiving conditions and with no room for error. 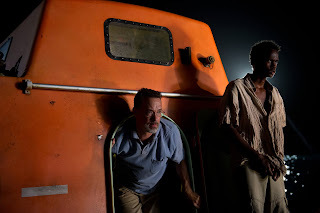 Hanks gets the final glory, Phillips finally not knowing what to do or what to say, letting go of his emotions, allowing the shock to take over in a postscript that summarizes the hijacking of a large ship into the human trauma of one ordinary man. Captain Phillips may have knowingly sailed into pirate infested waters, but the movie charts a mostly enthralling course.